NIU senior Jasmine Carey has had her eyes opened to a range of career possibilities in STEM education through her work with the STEM Outreach team at NIU’s Center for P-20 Engagement. 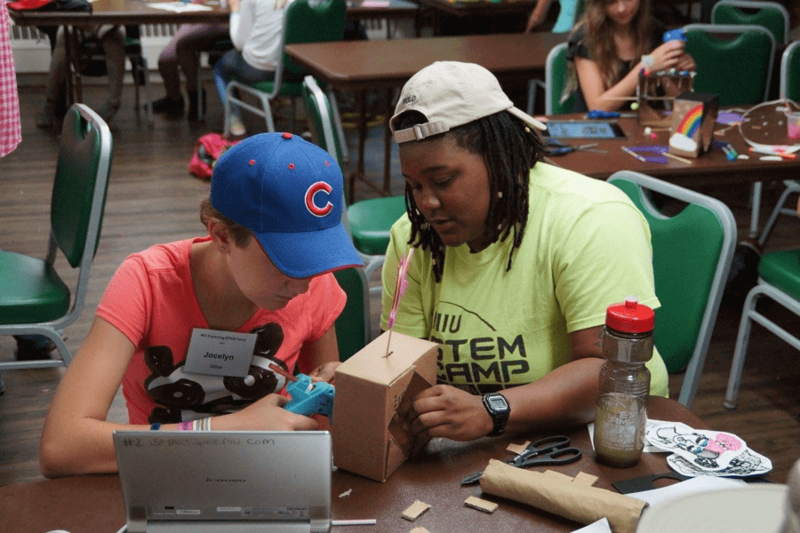 As an instructor at the center’s STEM Outreach camps and classes, Carey has connected with students from elementary through high school to share her love of science and technology. She’s also been able to put her engineering design skills to work building and maintaining some of the large exhibits that the team uses in STEM presentations, such as the PVC pipe organ. Carey is looking forward to the upcoming STEMfest, a full-day festival of hands-on activities for all ages celebrating innovations in science, technology, engineering and math. STEMFest will take place at NIU’s Convocation Center on Saturday, Oct. 21. Benson believes the experience Carey and other student workers gain at the P-20 Center will prepare them for career experiences they’ll encounter after college. “The work that Jasmine does with us, along with all of the students who assist with our classes and other projects, is important because it provides them with real experiences in the fields that they are interested in,” says Benson. To learn more about STEMFest or to sign up to volunteer, visit stemfest.niu.edu/stemfest. For more information about NIU STEM Outreach, contact 815-753-1272 or stemoutreach@niu.edu.